I first heard about baby led latch when I did my antenatal breastfeeding class. Back then it was all starting to get a bit overwhelming and to have someone say "and then there's a way of initiating breastfeeding where your baby does it all" I was immediately interested. After all, we survived for centuries without the internet and lactation consultants, surely there is something innate in our ability to feed ourselves at birth! The video here is not the only one i've come across on YouTube, there is also the Breast Crawl from a One Hour Old video, which is absolutely stunning. The beauty and instinctual wisdom, well it just gets me excited in way only babies can! Anyway, you'll notice a difference in the video below compared with the breast crawl video on the other page. This baby is older and yet still having a bit of trouble finding their way to the breast. It's likely this is one of the first times this baby has been given the opportunity to use baby led latch. If you are struggling with breastfeeding after a difficult birth or some unpleasant experiences in hospital and would like another way to try to initiate breastfeeding, baby led latch and breast crawl are options which are open to you for about the first 12 weeks after birth. Babies are continuously evolving, particularly at this early stage, and can be very open to change when given the opportunity. This can be a useful technique to try because it primes your baby's feeding reflexes for proper attachment and a calm experience. I'd also like to put in here that even if you aren't successful the first time you try it, it's worth giving another go. If this is still quite hard to get right, perhaps try positioning your baby more but still allowing them to attach. Check out my breastfeeding positioning and attachment video for more ideas. When I finally went into established labour I'd been in pre labour for 30 hours already. By the time my son was born 13 hours later I was exhausted. I can't imagine how tired he must have been! We tried to use baby led latch at that time but neither of us could really co-ordinate ourselves and after an hour (which felt like only about ten minutes in my deliriously tired but exhiliratingly happy hormonal state!) my midwife suggested I try to help him attach in a more structured way. In some ways I'm sad that this happened because I really do feel that if my husband had been better at helping me (so get your birth partner to read up) then we probably would have done a bit better job. Hopefully my hindsight can help you! Be patient, even if this attempt does not work you are still giving your baby an opportunity to establish the feeding reflexes of head bobbing, licking their lips and sticking out their tongue which will help them with your next attempt. If in doubt, seek help from an International Board Certified Lactation Consultant. I had trouble with blocked ducts and mastitis because my newborn wasn't attaching well. I hadn't thought it wouldn't be an issue because I was a health professional and somewhat informed. i was lucky though, I did know lots of natural mastitis treatment options (which are also great for blocked ducts). 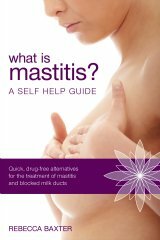 Having gone through the whole thing now and reflecting on what I experienced and what other mothers I treat experience I've got all those remedies together plus some tips for avoiding mastitis into a book "What is Mastitis? A Self Help Guide" to help you enjoy your breastfeeding experience as much as possible!